A hat-trick of victories on the course for Math, and once again the only runner to break 14 minutes, and nearly two minutes clear in the process. In the ladies the withdrawal of the previous winners Gina P and Sarah L left the way open for Menai’s Debbie Williams to win in an impressive 17.36, 17th overall, and the sixth fastest lady on the course’s history. 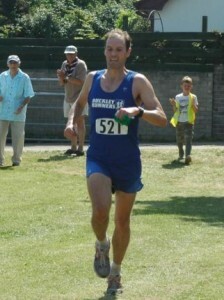 A special mention to Emyr Davies, 1st over 70, in a new record by two and a half minutes, and still the holder of the over 50s record. While a record 158 runners beat the train time of 23.27. The victories in the non-athletic teams, for the case of Budweiser, went to Betsi Runaways mixed team, and Tara L.C in the Ladies. In the children’s fun run non-appearance of their transport saw an improvised course, giving a victory to Morgan Gwyn-Jones and Mabi Goodland, who finished 2nd overall out of the 48 runners, all of whom received their Tesco goodie bags and certificates. Thanks to all those who helped on the night especially to John P who did all the electronic registration, ran the race, entered the timings and positions perfectly, despite runners from the predominantly northern road running clubs attempts at sabotage, by substituting from other categories and messing up the prize giving. Oh, by the way the moral of the funnel finish is don’t let anyone pass you whilst in it. It’s no good complaining after! Next year I will introduce chip timing but the entry will have to go up by five shillings to offset the cost! 28th July – Elidir Fawr is at 2pm, NOT at 11am as previously advertised. Can you please put details of the above, which takes place NEXT week, on the Eryri website. This will be the 30th running of the race; proceeds to Aberdaron & Rhiw branch of Yr Urdd. Mercher/Wednesday Gorffennaf 31 July, 7pm. Manylion Pellach/Further Details: W. Jones (01758) 760 450. Mike could really do with a bit of extra help at this Wednesday’s race the train in Caernarfon. If you can assist in anyway please give Mike a ring on 07778 145144. Blue, blue sky, not a cloud in sight and the temperature gauge on the car reading 250 c, so the perfect day for ice creams at the village carnival, except the carnival organisers were expecting a fell race! A record breaking race entry of 71 runners were set off by Alys Peake-Jones the Carnival Queen and headed off in the direction of the Ty Gwyn pub. No-one stopped off, as Lauren Jeska (L) (Aberystwyth AC) tracked last year’s winner Jez Brown (V40) (Buckley) to the first check point and on towards the summit of Tal y Fan. The leading pair, along with Chris Near (V40)(Eryri), Huw Davies (M)(Mercia) and Simon Edwards (V40)(Buckley) had a close race across towards the stone circle above Penmaenmawr, and back towards Rowen. By the footbridge Jez was 30 seconds ahead of Chris and Huw, with Lauren a further 30 seconds behind. After the final descent, Jez retained his title, with Huw 52 seconds behind, and Chris coming in 30 seconds later in third. Lauren finished fifth in a new Ladies course record time of 1:16:13, taking three minutes off the old record set in 2008. Nearer the back of the field the temperature was taking it’s toll, and the Landrover was sent out to check on the back markers, to find Iorweth enjoying the hose-pipe shower set up over the road about a mile from the finish, and providing a very tired Emma a lift to the finish. With everyone safely accounted for, it was back to enjoying the sunshine from the shade of the gazebo, with young Daniel making an excellent drinks waiter. A big thank you to all of our marshals, especially Sharon and Ann on the registration/start & finish, Mike Blake for becoming a water station monitor at short notice, and James McQueen sufficiently fit to volunteer to fill the vacant marshal post. Following last years successful event the Fabian4 Dyffryn Conwy Mountain Triathlon is to be repeated. Following last year’s very successful event, the Fabian4 Dyffryn Conwy Mountain triathlon will take place again this year on Sunday, 8th September. It is being organised by Map17 Events, a team of seven local enthusiasts (most of whom you will know!) who are all experienced race organisers & competitors. We have succeeded in putting together the three disciplines of open-estuary kayaking, fell running and mountain biking, to create a magnificent journey from the sea to the mountains, all set in a stunning location on the edge of the National Park. Leg 1 is a 13k open-estuary & river kayak which starts below the walls of Conwy Castle, and proceeds up the Conwy River on a fast rising tide, to the first transition at Dolgarrog Bridge. Leg 2 is a 13k trail/fell run, starting & finishing virtually at sea-level, but reaching an altitude of almost 500m. It has a real mountain feel with views to match, especially when crossing the high ridge between Llyn Cowlyd and Crafnant. To our knowledge, none of the ground covered had been raced before last year’s event. The leg finishes along the ‘Trefriw Trail’ leading to the transition at Nant Conwy Rugby Club. Leg 3 is an 18k mountain bike race, starting and finishing at the event centre. The route is mostly within the Gwydir Forest above Llanwrst, and permission has been received from the Forestry Commission for a new route this year, using more of the Marin Trail than in 2012, with a consequent increase in the amount of single track, both up and down. This leg finishes with a bumpy descent, crossing a ford for good measure, to ensure that everyone arrives back at the event centre as muddy & wet as possible!! Once again, our event centre is Nant Conwy Rugby Club’s new club house, which offers very impressive facilities. These include a bar/dining area with a terrace overlooking the stage 2 transition, free Wi-Fi, hot showers/loos, projection facilities for the live results service, plenty of parking and areas to camp. This will ensure that supporters, as well as competitors will all enjoy a fun day in a great venue. We are fortunate enough to have been offered prizes from many local sponsors (which are listed on our event website), & so we can promise a good selection of prizes for all category winners (Seniors 18-39, Vets 40-49, Masters 50-59 & Grand Masters 60+ for both genders), as well as for the winning team. There will also be a goodie bag for all competitors. The profits will again be donated to the Snowdonia Society, which is working and campaigning to conserve Snowdonia National Park, from which we are all fortunate enough to benefit, in so many ways. We are non-commercial event organisers, relying on local volunteer help, and following last year’s success, it looks as though the race will become an annual event. Our aim is to encourage participation in, & enjoyment of the event by as many local people as is possible, so please come & show us what you’re made of, or perhaps volunteer to help. See www.map17events.org.uk for further details. Under warm & sunny skies, and with a good turnout of 90 runners this classic race got underway at 14:00. From here-on however things did not go entirely to plan as less than 10 minutes later Ali Thomas came into view running back to us at the start line. It soon became clear that we had a major incident on our hands. Ross Powell, who had done such a good job all week in helping me take over the race organising from him, had collapsed less than a mile up the route and was in a serious condition. My thanks here to Ellie Salisbury who later clarified the full sequence of events up on the track, I will keep these brief but put simply: Thanks to Mark Wright (Clwydian Range Runner & a Paramedic), Kate Worthington (Eryri Runner & a First Aider), Ellie Salisbury (Vet) & Maggie Oliver for staying with Ross for 25 Minutes until he had stabilised. Also to Dei Jones and Malwyn Evans and another guy who stayed at the incident for 20 minutes in case they could be of help. Thanks to Ali Thomas who ran for assistance and is a DNF of the best possible kind, and to Joanne Moore who wasn’t racing but helped by running back to us at the start to coordinate the MR Vehicle & Ambulance. I am pleased to say that 2 days on Ross is reported as being home and in good health but facing some more tests as an Outpatient, we all wish him & Sheila the very best. Back to the race itself it was won by Felipe Jones of Aberystwyth in an excellent time of 48:12, Felipe was a Welsh National as a Junior and is of course well known to us all. 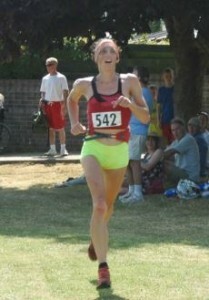 The Women’s race was won by Anwen Darlington from Sheffield AC. Anwen is an under 23 year old, an Orienteer, and apparently has a talent for descending, overtaking at least six runners on her way down from the summit. Other category winners were Martin Cliff of Eryri (last year’s winner) Male O.40, Steve Toogood Male O.50, Martin Cortvriend Male O. 60 (finishing in the top half), Jayne Joy Female U.40, Helen Teasdale Female O.40, Emma Collins Female O.50 & Maggie Oliver Female O.60. To round off a superb effort in hot conditions (here the wondrous support given to Ross just highlights what a great community Fell Running is) many runners were seen bathing in the river before enjoying a somewhat chaotic Prize Giving in the late afternoon sunshine. My thanks to all the Marshalls, Team Dolly Radio Support, Ogwen MR, Paramedic, Ambulance crew for their help, fortunately instances like these are rare but when they were needed they were there and did a great job. Finally my thanks to all the runners who turned up, for their patience and words of support for what was a great day in Capel Curig.